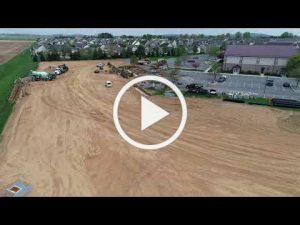 Check out this project update for Ephrata Community Church! 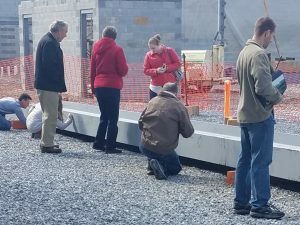 At the end of April, Horst Construction officially kicked off construction on the “Vision 20/20” project at Ephrata Community Church. Work has continued to move along nicely despite numerous weather events and record rainfall this summer. Check out these cool progress videos! It’s amazing how far we’ve come in the past few months! Videos courtesy of Ben Sauder Visuals. The project reached a noteworthy point this past weekend, when the congregation was invited to sign the 10,000 lb. main support beam. 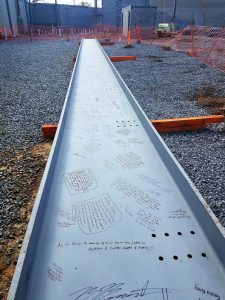 This beam is 60 ft. long and will remain exposed after construction to immortalize the messages and signatures it contains. 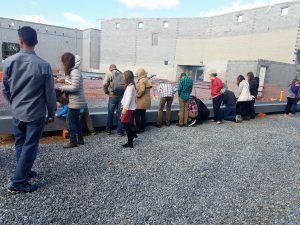 Beam signing ceremonies are an excellent way to engage congregations during a construction project. 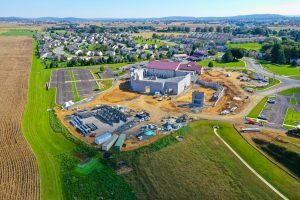 This project includes an expansion of 104,000 sf, providing a 1600-seat auditorium, mezzanine seating, lobby, 15 classrooms, 20 offices, 2 large meeting rooms, a gathering space and cafe, welcome center, and indoor play area. The project also has a 15,400 sf renovation component to include a multi-purpose room, new kitchen, additional lobby space, gathering/game room, and cardio gym space. Stay tuned to our social media channels for additional video updates as the project progresses!